Utah’s Parker Van Dyke never passes up a big shot. And the Utes are glad he doesn’t. The senior guard is playing loose and free, determined to make sure his last season as a Ute counts. (Francisco Kjolseth | The Salt Lake Tribune) Utah senior Parker Van Dyke hits big shots and these Utes will need their senior leader as they push toward a deep run in the Pac-12 tournament. It dawned on him, as it dawns on everyone who came before him, that while yes, he’s having the time of his life, living out this childhood dream he considers himself lucky to be living, the calendar is shifting toward spring and that means soon Parker Van Dyke will have to embrace change. Everything he’s ever known, though, is red, whether it be the campus near his childhood home, the ear-splitting din inside the Huntsman Center or those frosty fall nights inside Rice-Eccles Stadium. So when he finally can no longer block out the inevitability of what is to come — the end of his career as a Utah Ute — he has decided that the only way to manage the moment is to stare it down and embrace it. If you pay attention to Utah basketball, or if you’ve watched SportsCenter in the last couple weeks, you’ll have noticed the 6-foot-3 senior splashing 3’s, playing unafraid, letting loose shots from distance that he says every time he flicks his right wrist it just feels right and it’s easy to understand. Parker Van Dyke, who has hit 19 3-pointers in his last five games, is on fire. There will still be plenty of moments for him to remember, still shots to make, and with March around the corner, the madness begs for heroes — a role in which Van Dyke has stepped into for the Utes. The buzzer-beating 3-pointer at UCLA on February 10 immediately thrust him into Utah lore, a program pedestal where his Ute heroes have long resided. It capped off a comeback that was a few minutes earlier, by all logic, impossible. And he did it in Pauley Pavilion of all places, a legendary home of hoops, and from now on, every time Utah travels to Westwood, Calif., the game notes will always list Van Dyke’s big shot. A self-acknowledged Utah basketball history buff made some of his own. Naturally, it was the No. 1 play on SportsCenter’s Top 10 plays that night. It had to be. Van Dyke, one of just three seniors on a team that, at times, starts as many as three true freshman, is showing the young guns how it’s done at Utah. Not that they need hand-holding or extra guidance, it just helps that when you have a personality like Van Dyke, you utilize him in more scenarios than freeing him up in the corner for another open 3. No, it was not a dream. His advice, and it seems to be paying off, is this: embrace the grind. Van Dyke is everything encapsulated in Utah’s program under coach Larry Krystkowiak. Van Dyke, too, helped build Krystkowiak’s model at Utah. He was one of the early, premier in-state recruits who chose red. Back then, as a star at nearby East High, he was the do-it-all guy, the scorer, the facilitator, the man. He embraced that role because he had to. 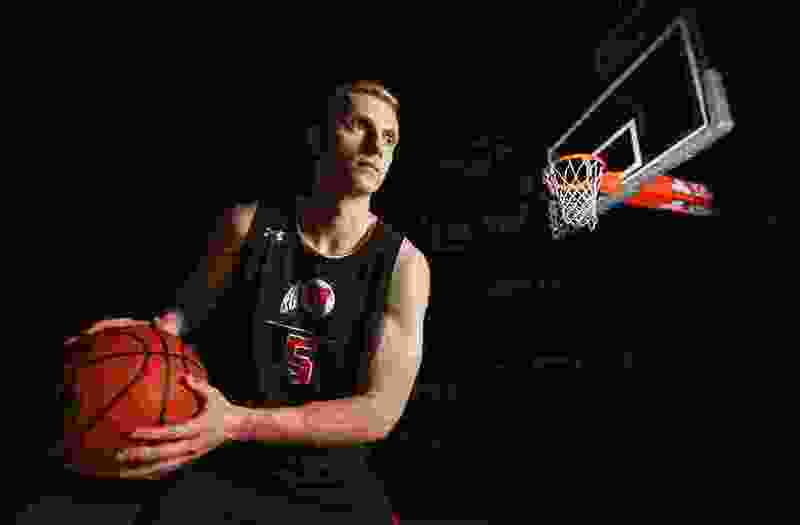 Growing up on the star-studded AAU circuit playing with the likes of Nick Emery and TJ Haws, Van Dyke was the distributor. At Utah, he later had to figure out his role over several years. He left on a mission for The Church of Jesus Christ of Latter-day Saints after his freshman year and returned to have to find different ways to get on the floor and make game-changing plays. “Now to see him be the person who is relied to put the shot up is pretty cool,” said Parker’s father, Paul. Like his son, Paul Van Dyke isn’t letting anything get lost in the fray in regards to his son’s career. This is what they all imagined decades ago. It’s meant to be, he said, because why else would Parker wear No. 5 (in honor of Utah great Josh Grant) or be playing for the coach in Tommy Connor who taught youth basketball camps before Parker was even in elementary school. Utah legend Arnie Ferrin is their neighbor, too. How many guaranteed games left in that jersey are unknown, but he’s not thinking about it right now. He’s instead focused on the now, not what might happen when this era of life ends. He’s into freeing up his mind and freeing himself up from opponents and letting shots fly and thinking of the impending splash.